The programmer design simple, and operate easily through OBD directly and no need to press any button. 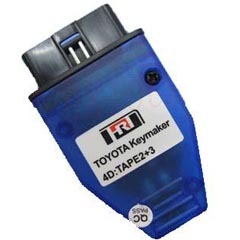 Support all Toyota 4D chips, with the original key programming protocol, non-general initialization protocol. Safe and highly effective: Only about 10 second to program a new key; the anti-thelf system will not be damaged in safe using way, it is the most quickly and safest programmer. 1. Turn the ignition on with the right 4D chip key. 2. Connect the programmer to the OBD port of the car, there are some short beep sounds after power on. When the connection with the Computer of car is done successfully, there is a long beep sound in 3 seconds, and the ÃÂ¢Ã¯Â¿Â½Ã¯Â¿Â½LED?is on, as well as the anti-light ÃÂ¢Ã¯Â¿Â½Ã¯Â¿Â½SEC? which means the car is in the ÃÂ¢Ã¯Â¿Â½Ã¯Â¿Â½key programming state? 3. Take away the programmer from OBD. a) Close all the car door. b) Insert the first new main key to the ignition for 5 seconds. c) Insert the other main key to the ignition for 5 seconds. d) Insert the vice-key to the ignition for 5 seconds. e) The new ignition key will be confirmed by the new IMMO. a) Close all the car doors. b) Insert the new key for 5 seconds. c) Insert another new key for 5 seconds. e) Insert the first programmed main key, and turn on the ignition for 5 times quickly, then take it out. 1. Must use the right Toyota 4D chip, otherwise you take the consequences. 3. This machine is only provided for the legal auto repair. Otherwise you will take the above consequences.